You know the cool feeling on your feet every time you open the refrigerator door? If you didn’t know, that’s the feeling of all your cold air falling out on the ground. Cold air is heavy and naturally sinks down, which makes the design of most refrigerators suboptimal for conserving that cold air when opened. Though convenient, this means that your refrigerator will be using a lot more energy than is necessary. Well, what can you do about it? In Japan there are refrigerators with pull out drawers that help eliminate some of the problem, but importing a massive Japanese appliance isn’t likely to happen for most of us. Luckily, there is a DIY solution that involves converting a deep freeze into an incredibly efficient refrigerator chest. You can check out the DIY PDF here, but in summary, what the creator, Tom Chalko, did was get a chest freezer and modify the temperature control so that it held foods at the normal temperature a standing refrigerator would. In the end, Tom had a fridge with a slightly non-traditional organization of foods, but one that only used about 100 watt hours of power a day, compared to most refrigerators, which use between 1 and 2 kilowatt hours per day. If you’re interested, be sure to check out the PDF for some more specifics. Tom also put together a web page, and aparts list to make duplicating his efforts quite easy. 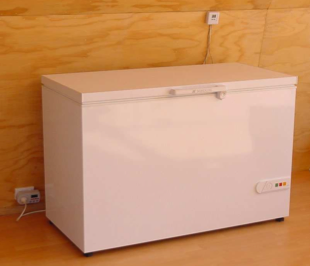 Also, check out our article on a DIY Passive Cooled Fridge, and our series on DIY improving your freezer’s efficiency. My usage is very important. When you look at a conventional ‘energy star’ unit you will find the consumption for a year is at least 200-500 kwh. My 16 panel solar system produces 1000 kwh per year. That would be almost half of my production from solar. Within 100-150 kwh per year, it becomes feasible to have refrigeration. Major problems are with the limited insulation. Why dont they just add another inch so you dont have to? And the position of the compressor and condenser coil. Why on earth would you put in under the fridge? Put it on top like in the old days and the heat goes in a direction that does not affect the fridge. Putting it under just transfers all that heat it just removed right back up towards the fridge. Some things just arent rocket science. If you want to get really chic put two compressors on the unit and one is outside. In summer, valves like a heat pump valve put all the heat outdoors and in the winter, indoors to help heat the house. I’m not affiliated with Dr. Tom Chalko in any way but proper credit should be given to all those who are responsible to come up with the findings. To be honest, I’m not sure why proper credit was not given. I actually didn’t write this article. An old writer for EcoRenovator did even though it says my name on it. Thanks for the links. I’ll update the article. Thanks Tim. I’ve seen your update and looks very good!